SAN FRANCISCO — The Consulate General of Japan in San Francisco and the Center for Asian American Media (CAAM), with the cooperation of New People will present a screening of “Astro Boy: The Movie,” a talk by Frederik L. Schodt, and a special exhibition, “Astro Boy: The 60th Anniversary Exhibition” at the 2013 CAAMFest. The screening will take place on Friday, March 22, at 5:30 p.m. (doors open at 5:15 p.m.) at New People Cinema, 1746 Post St. in Japantown. Following the 94-minute film, there will be a 25-minute slide presentation and Q&A session by Schodt, author of “The Astro Boy Essays: Osamu Tezuka, Mighty Atom, and the Manga/Anime Revolution” and translator of the Japanese manga series into English. “In an age when most American superheroes fought for a patriotic form of justice and had special powers derived from mysterious, almost cosmic sources, Astro Boy was utterly original. … His powers were based on semi-scientific or mechanical principles, and instead of fighting for justice, he fought for peace,” Schodt wrote. 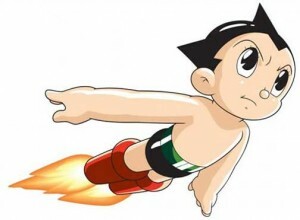 Starting as a Japanese manga in 1952 by Osamu Tezuka, “Astro Boy” (Japanese title: “Tetsuwan Atomu”) was the first official anime released in America. Through the decades, it has evolved, been remodeled and become a household name through animated (and live action) TV series, many video games and toys, and most recently the 2009 American film. The film tells the origin story of Astro Boy, a young robot with incredible powers, created by a genius scientist who dreams of replacing his dead son. In a Metropolis-like futuristic city, our young hero embarks on a journey to find his place in the world, ultimately mastering his powers to protect those he loves from alien intruders. The voice cast includes Nicolas Cage, Charlize Theron and Freddie Highmore. The Astro Boy spotlight will display many rare items to help celebrate the anniversary of this global hero, including rare TV episodes, classic manga, and video games to play. Attendees are invited to dress up as Astro Boy or a robot for a cosplay contest.